The “small round” surveys of the NSSO are usually not considered to be so good at capturing trends, because their smaller size makes them non-comparable with the quinquennial large surveys. However, the 64th Round was a much larger survey than normal (with a sample of 1,25,578 households: 79,091 in rural areas and 46,487 in urban areas, covering a total of 5,72,254 persons) and was concerned primarily with employment and migration. It therefore allows us to examine the effects of one of the biggest public intervention in rural labour markets in several decades: the Mahatma Gandhi National Rural Employment Guarantee Scheme (MNREGS) which was implemented from 2006-07 and by 2007-08 had formally spread to cover all the districts of the country. The MNREGS has been critiqued from different angles and at many levels: for the corruption and leakages; the patchy and often inadequate implementation; the non-payment of minimum wages, and so on. But more recently, another more unexpected kind of critique has emerged, and that too in the highest policy-making circles: that the MNREGS is pushing up the wages of rural workers in a manner that is raising costs of cultivation for farmers and making it hard for them to compete in a very uncertain world economy. To some it may come as a surprise that this is even seen as a criticism. After all, surely the purpose of any such scheme would be at least partly to improve the conditions and the bargaining power of rural labour? And if that is then reflected in higher wages, should that not be proof of its success? At the very least, surely government representatives should be happy when the wages come closer to the legal minimum wage — that is, of course, if they are at all serious about implementing their own laws. Such a tendency to increasing wages should definitely be celebrated in a country in which poverty and undernutrition are so rampant especially among the rural labouring class. In addition, they should be happy because higher wages in the countryside also mean increased effective demand for rural goods and services, and contribute to reviving a very distressed rural economy through the multiplier effects of workers’ spending out of wages. But what is the actual evidence of such a tendency to rising wages in rural areas? 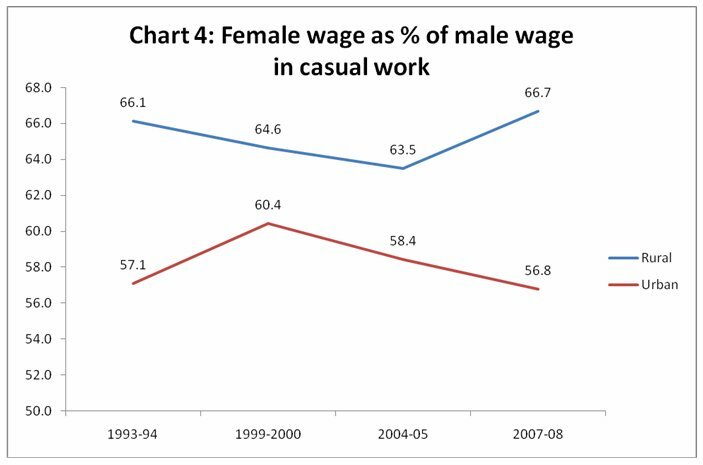 The 64th Round of NSS allows us to compute the changes in wages of male and female casual workers. Chart 1 shows the pattern of rural wages (deflated by the CPIAL). It is clear that, for both male and female workers in rural areas, the MNREGS has made a difference in terms of increasing the wage rates for casual work. Real wages increased for both male and female workers, and indeed more rapidly for female workers. This was in marked contrast to the pattern in urban areas, where wages for casual work were more or less stagnant for female workers. 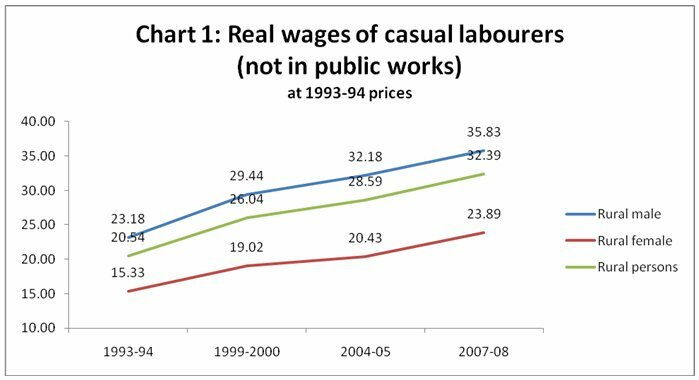 Incidentally, it is also worth noting that casual wages in agriculture did not increase in real terms according to this survey; rather they remained stagnant. It should be noted that the tendency of higher rural wages to push up costs of cultivation can be greatly overplayed, because wage payment typically accounts for less than half and usually around one-third of total agricultural costs. In any case, a public procurement system that takes into account all paid labour costs (as the CACP measures do) would adequately compensate for such costs, which would at most lead to only a marginal increase in prices. But to what extent can the increase in rural women’s wages be ascribed to the effects of the MNREGS? Quite a bit, it turns out. It is well known that women’s involvement in this scheme has been much greater than was mandated by the 30 per cent reservation of employment and also much greater than expected in many parts of the country. 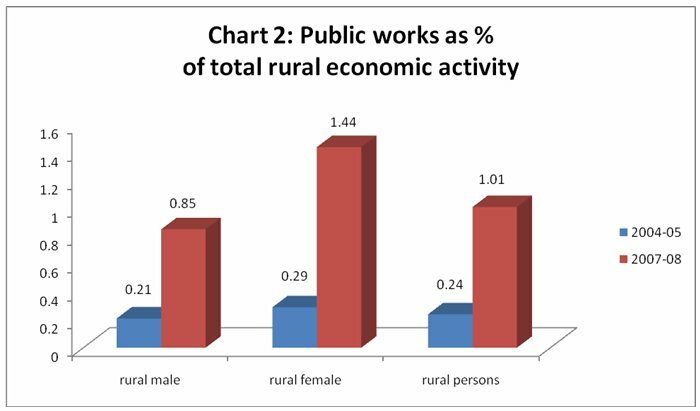 Chart 2 shows that, while involvement in public works accounted for a much greater proportion of economic activity in rural India, the increase was particularly sharp for rural women. Between 2004-05 and 2007-08, the days of employment of rural women in public works increased around 4.4 times, a remarkable shift in terms of involvement in paid work. An important reason for that emerges from Chart 3: the MNREGS has been so successful in attracting women workers because there is hardly any gender gap in the wages paid, unlike almost all other forms of work in rural areas. In fact, the average wage received by women workers in MNREGS was slightly higher than the average wage received by men. This compares very favourably even with other form of public works, but particularly with non-public work, where the gender gap remains huge. Further, on average, wages received in MNREGS were significantly higher than those received by casual labour in other kinds of work. A look at the trends in gender gaps in wages confirms this point. Chart 4 shows female wages as a percentage of male wages in both urban and rural parts of the country. India already had one of the highest gender gaps in wages in the developing world, and in urban India this gap worsened in the first half of the past decade and remained at around the same level thereafter. However, in rural India there has been a significant reduction in the gender gaps in the latest period, and this can be related very substantially to the impact of the MNREGS. This impact is both direct, in terms of the higher wages paid to women in this scheme; and indirect, in terms of the effects on women workers’ reservation wages and bargaining power. Surely, even the most diehard opponent of the scheme would find it hard to argue that this is a bad thing. Indeed, even if the MNREGS has been only marginally successful in raising male wage rates in the countryside, the effect of the scheme in raising female wages is already a major positive feature that should be applauded. 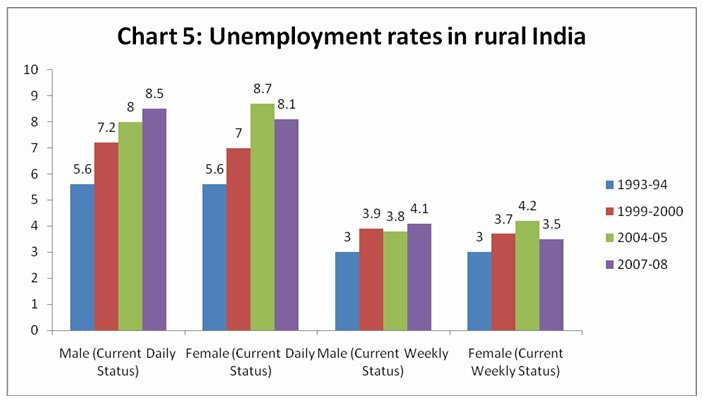 The gender-differentiated impact of the scheme on rural labour markets continues to be evident in terms of unemployment rates, shown in Chart 5. For male workers, there has been no impact on this feature: in fact, unemployment rates (by both Current Daily Status and Current Weekly Status indicators) have continued to rise. However, female open unemployment rates have shown decline, albeit relatively marginal falls from their previous highs. What this does indicate is that, for all its flaws, limitations and difficulties, this scheme has already had positive effects on women workers in rural labour markets. It has caused real wages to rise, gender gaps to come down and open unemployment rates of women to decrease. Before the scheme was implemented, these were not really anticipated as likely outcomes. But this positive impact may well have longer-term beneficial effects on social and economic dynamics in rural India. C.P. Chandrasekhar is Professor at the Centre for Economic Studies and Planning at Jawaharlal Nehru University. He also sits on the executive committee of International Development Economics Associates. Jayati Ghosh is Professor of Economics at the Centre for Economic Studies and Planning at Jawaharlal Nehru University. Chandrasekhar and Ghosh co-authored Crisis as Conquest: Learning from East Asia. This article was published by MacroScan on 11 January 2011; it is reproduced here for non-profit educational purposes. Which One Gets to Be Called a Terrorist?